In this interview I catch up with one of the bass world’s rising stars. At just 24 years of age, Brad Miller is regarded by many as ‘one to watch’, having already built up an impressive CV of live work with the likes of Randy Bernsen, Ira Sullivan, Oz Noy, Kofi Burbridge and Othello Molineaux. He’s come a long way since he was a kid listening to big band music around the house (Brad’s Mum dated Frank Sinatra!) 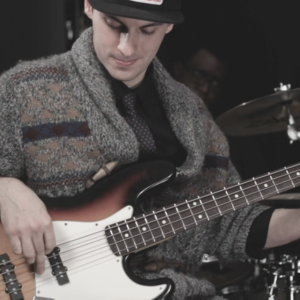 His trademark grooves and outstanding musicianship are at the heart of Brad's ongoing success as a bass player for hire. In this interview, you're also going to see two exclusive performances from Brad’s band! Acoustic/electric bassist making waves in the NYC music scene. How Brad first got into the bass. What it was like living with Julius Pastorius. Why he made the move to NYC. Why he switched to a Fender Precision. All about his FX pedals.